Chicken Shawarma recipe by hotline_hl at DesiRecipes.com. Preheat oven to 350. Toast sesame seeds for 5-10 minutes, shaking the seeds frequently with a spatula. Do not allow to brown. Cool for 20 minutes. Pour sesame seeds into food processor and add oil. Combine all ingredients except for chicken , fillings, and sauce ingredients to make marinade. If it seems a little dry, add a little olive oil (a tablespoon at a time). Grill chicken for about 10 minutes on each side or until fully cooked through. 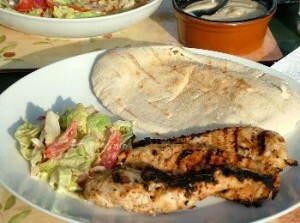 Serve chicken on pita and top with tomatoes and Shawarma Sauce. its arab style shawarma, can u plz share the pakistani version which is sold out on stalls. wat ive seen is so simple but the whole ingredients i dont know. IT SAYS GRILL FOR 10 MINUTES ON EACH SIDE. READ THE RECIPE!!!! I guess we eat the chicken raw!!!!!!!!!!!! I think that we are supposed to bake the chicken. Not sure.